Is LibDib a broker? We get that question all the time and the answer is no, we are not a broker. LibDib is a fully licensed, three-tier compliant wholesale distributor. We utilize a technology platform to connect buyers and sellers in a modern and efficient way. And no worries if our model causes you to scratch your head and ask “What exactly is LibDib?” We do things differently and sometimes that’s hard for some people to wrap their brains around. 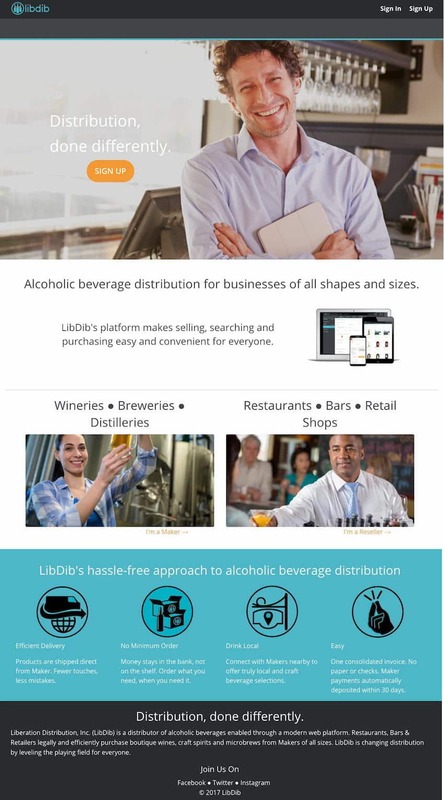 We’re evolving alcohol distribution and it’s huge that we provide access to ANY Maker that wants it. However, change and evolution are both parts of being a Silicon Valley technology company (yes we are that too!) and we understand that sometimes we have to explain our business model in a little more detail, to industry veterans and newbies alike. LibDib has worked really hard to become licensed as a distributor in each state that we operate in. It requires A LOT of forms, diligence and compliance. We follow all regulations (just like every other distributor in the U.S). It’s what sets all of us apart from “fourth tier” options, which are unlicensed. Being a wholesaler has provided us with the opportunity to partner with other amazing distribution partners as we expand to new markets. So, what does a broker do vs. a distributor? A broker is an unlicensed entity who helps brands with sales, sometimes marketing, and distribution. Whether they are a brand’s ‘feet on the street’ or negotiate deals with distributors, they are people who help Makers sell. We happily work with brokers, but not all of our Makers use them. It really depends on the Maker’s needs and goals. It’s important to note that a broker cannot legally process an order from a retailer, bar or restaurant. They cannot invoice or collect from the account. They can’t price post or report sales and taxes. The regulations require the order to be processed through a licensed distributor/wholesaler. That’s how the three-tier system works. Libdib offers hundreds of products from all over the world. Cool stuff not available everywhere. Resellers order online or from the Maker, really utilizing the best ordering process that works for you. LibDib gets it to you compliantly. Super simple. 100% three-tier compliant. Hit the Ground Running: Tips to Make 2019 the Year of SellingWhat if we told you signing up with a new distributor can be easy and you could be buying new craft spirits & wine online in a matter of minutes?